Above: Rouge Bunny Rouge Kiss Elixir...dreamy, hydrating lip balm. Exciting news, Rouge Bunny Rouge fans! The gorgeous line, known for its rich shades and whimsical je ne sais quoi is undergoing a beautiful metamorphosis. From fresh reformulations and the release of new products to stunningly streamlined packaging featuring a matte and glossy black design, stay tuned for regular updates on this spring awakening. Up first is the *Kiss Elixir...this lush balm has been reformulated to offer even more hydration and the chic matte black squeeze tube reflects the new Rouge Bunny Rouge aesthetic! The Thorn Fairies in the Enchanted Garden do suffer for their impudent work, but still love to look gorgeous! Inspired by their quest for hard-working beauty this lusciously hydrating, healing balm with a subtle shine keeps lips soft and kissable even in the midst of winter. 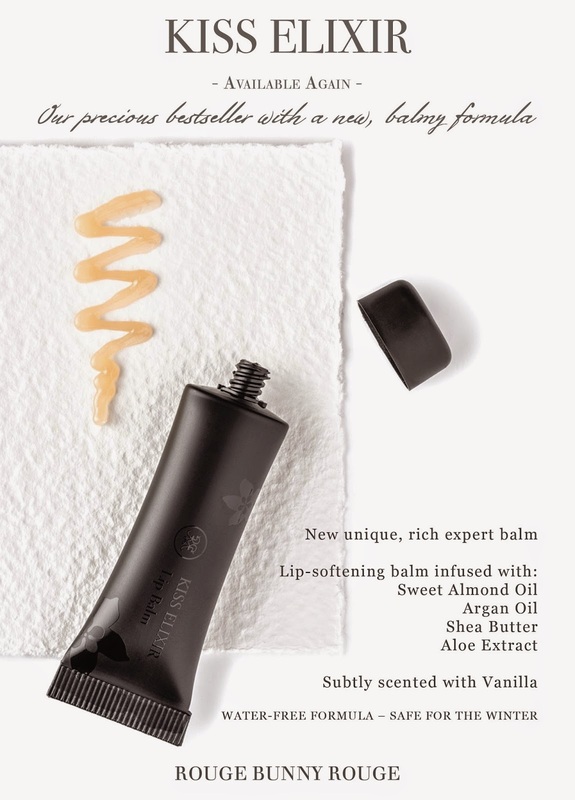 A soothingly rich, oil-infused elixir with just a hint of vanilla and most sensuous glide, melts as smooth and creamily as butter. Go ahead and invite dreamy nuzzling with your beautifully protected and bewitchingly comfortable lips. Based on a soothing blend of precious natural oils and butters, our KISS ELIXIR Lip Balm is lovely for every winter-tired pout, while offering natural skin protection throughout the year. This expert balm’s unique rich and creamy texture that leaves lips ultra soft is suffused with Sweet Almond Oil, Argan Oil and Shea Butter to offer immediate relief for dry and chapped lips. Scent-free Beeswax and precious Aloe Extract soothe and provide a completely non- sticky finish. The delightful flavour of Vanilla brings a pleasant sensation of comfort. Our clear Lip Balm can be applied with just your fingertips, doubles as lip gloss and offers superior hydration and a sustainably soothing, nourishing effect. Winter-safe: free from water. Above: A swatch of Kiss Elixir in direct sunlight. The Kiss Elixir Lip Balm is superb. The clear formula has a plush texture that instantly nourishes the lips, leaving them looking plump, juicy and moderately shiny. Although it is delightfully non-sticky, there is enough "tack" to enhance its longevity. My perennially dry lips are vastly improved with every application! All in all, this is a must for lip balm lovers, Rouge Bunny Rouge devotees and those in need of immediate lip hydration...highly recommended. Above: The Rouge Bunny Rouge Kiss Elixir on the lips over a touch of Charlotte Tilbury lip pencil in Pillow Talk (applied 7 hours earlier). Bottom Line: I hope you are as excited as I am about the impending Rouge Bunny Rouge releases! The Kiss Elixir Lip Balm, which can be procured from the Rouge Bunny Rouge Boutique, is a divinely hydrating formula that works well on its own (as pictured above) or as a base for lip color and the sleek tube makes it endlessly portable. As aforementioned, I will continue to update here as the Rouge Bunny Rouge metamorphosis unfolds this spring! What are some of YOUR favorite Rouge Bunny Rouge products? Good things in the queue, including a fresh foundation review, a skincare update and January Favorites and haircare videos! Thanks for the sweet words, Carina...yes the new releases are a thrilling thought, indeed. So appreciate your kind compliment! How would you compare this to the Bite Lips Masks?